Our vision is to provide Top Quality Personal guidance; and Best Technology Practice Platform at an Affordable price to our students. 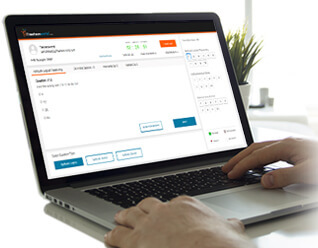 Unlike home tuitions, which are too casual, unstructured and lacking in facilities/resources and unlike video-based lectures, which are non-interactive, lacking in student-teacher engagement and are unsuitable for non-visual learners and those who are less motivated, SpeedLabs drives home results through practice under personal guidance. Let’s face it – even the best sports players require an excellent coach to bring out their best, and bringing out the best in every student is precisely what SpeedLabs strives toward. At SpeedLabs, students benefit from a variety of elements, including personalized instructions and attention, one-on-one guidance, regular corrective feedback and positive reinforcement, interactive small-group sessions that encourage dialogue, participation and application of instructions, small class sizes of 6-8 students per teacher, which minimizes student’s tendency to let their attention wander, individual and guided practice study sessions, focus on grasping concepts at a root level, development of self-study habits, which will be useful in college in the long-term, no distractions (mobile phones are not allowed during practice sessions) and methodical identification of areas of improvement for each student, combined with focused efforts to address these through structured practice. Furthermore, SpeedLabs’ integrated technology based platform paces practice assignments at each student’s appropriate level, with monitoring of performance, gap areas and progress, as well as in-depth personalized insights after each practice session. TEEVRA EDUCATION PVT LTD recruiting Education counsellor candidates nearby Mumbai, Navi Mumbai.TEEVRA EDUCATION PVT LTD vacancies for Education counsellor is recruited through Written-test, Face to Face Interview etc. TEEVRA EDUCATION PVT LTD Company recruits a lot of candidates every year based on the skills . The candidates with 12th Pass (HSE) are selected to full fill the vacancies in Counsellor job field. The candidates nearby Mumbai, Navi Mumbai can apply for Education counsellor position in TEEVRA EDUCATION PVT LTD. All candidates should have a degree or post-graduation in the required field based on the requirement mentioned. The jobs are available in Full Time basis. When it comes to the TEEVRA EDUCATION PVT LTD recruitment, candidates are mostly chosen for the department of Counsellor . To learn more about the current jobs and other details, it is better to go through official site of TEEVRA EDUCATION PVT LTD and Freshersworld. Find the latest jobs near you and near your home. So, that you don’t need to relocate. The Freshersworld is a leading employment portal that researches the official site of TEEVRA EDUCATION PVT LTD and provides all the details about the current vacancies, the application process, selection process, interview test details, important dates and other information. Search and apply for the top job positions in TEEVRA EDUCATION PVT LTD and near your city and get a secured career.